This is a set of four ST Racing Concepts 17mm hexes, and are intended for use with the Traxxas Slash, Stampede, Rustler and Bandit 1/10 scale electric vehicles, as well as the Nitro Slash. This new 17mm hex conversion kit allows Slash, Stampede, Rustler and Bandit owners to use high-traction 1/8th scale buggy tires for increased performance and a larger selection of tires. 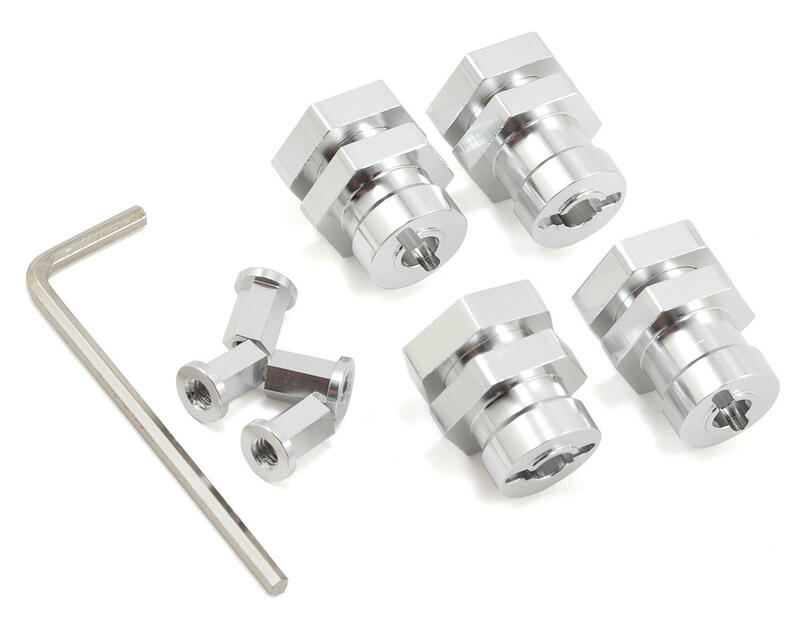 This conversion kit has been done right, by including a specific set of front steel axles that allows proper installation of the front 17mm hex adapters. Each 17mm hex adapter has been machined out of high-quality aluminum, and using a unique set-screw behind drive pin design, you’ll never have to worry about loosing a drive pin. 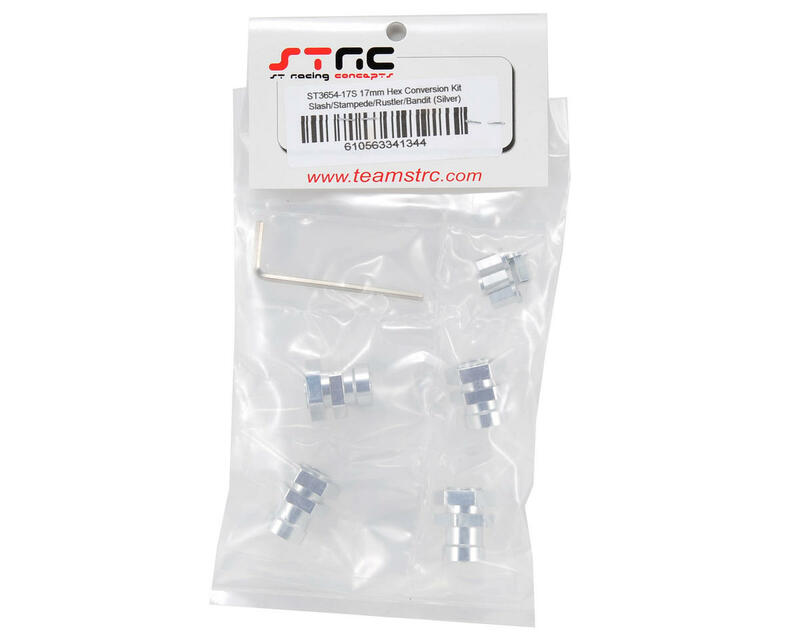 Note: For owners with MIP CVD's installed, you'll need to purchase this set of drive pins from Team Associated. I have a lot of STRC parts on my Slash, on my AE T4FT and on my OFNA Hyper 10SC. For the most part, the products are excellent and I have been very happy with them. I cannot however, say the same about the STRC 17mm Hex Conversion Kit for the Slash. If you are running brushless, the Associated pins that are a necessary part of the 17mm conversion will shear. This is pretty much guaranteed. When the third replacement pin failed, it sheared on both sides of the axle, went a half turn and wedged itself inside the adaptor. This made it impossible to remove and replace. I had to destroy the adaptor to get it apart. I bought these because they are a lot less hassle to put on and take off to service bearings etc., as compared to the AKA adaptors that I had been using. I had used the AKA conversion kit for a full season of racing with no failures or issues (other than they are a bit of a pain to get shimmed correctly). With the STRC set, I DNF'd three heat races because th epins sheared. Needless to say, I am back to using the AKA set on tracks that allow the use of 17mm 1/8 buggy wheels and tires. I sent an email to Steve at STRC outlining the problem but I never received a reply. I was hoping to hear that they had a recommended fix (a better pin or something). As it is, the pin is too small and weak to take the power of brushless motors they way they are used within the adaptors.